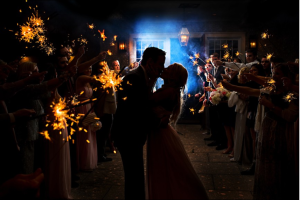 The Wedding Photojournalist Association named Jessica Stout the 4th place photographer in the world for 2015. I met Adam for the first on the day of the wedding. I introduced myself and said "wait until you see Marissa, she looks amazing!" He grabbed his chest, took a deep breath and held back tears from that statement alone. 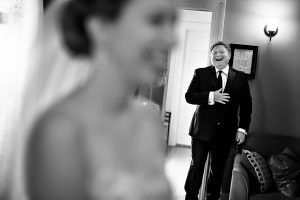 I knew by his reaction, that I would need to be prepared and precise with my lens choice to document his response to seeing her walk up the aisle. It was an honor to document this moment. 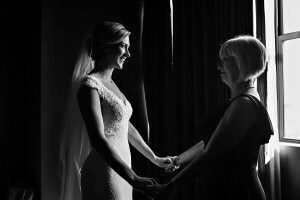 We love the moments shared between a mother and daughter in the bridal suite...especially when her veil is on and the look is complete. I love the pride in Gail's face as she looks upon her daughter. Shira is unaware as her father enters the bridal suite to find his daughter a bride. His reaction is so incredibly sweet and requires no explination. 15 minutes prior to the ceremony, the skies were sunny and blue. 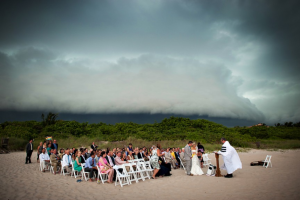 Typical Florida weather, the storm raced in just as the ceremony began. 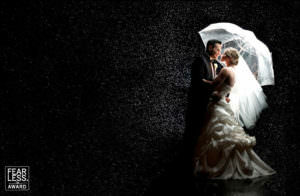 After a quick ceremony and the officiant said "you may kiss the bride" the rain came pouring on us all! 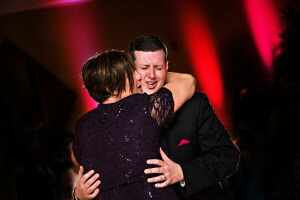 Such a sweet, raw moment between our groom John and his mother! 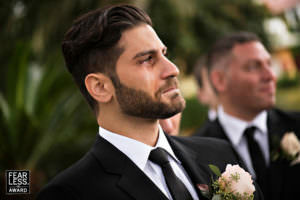 The groom and all of his guests became overwhelmingly emotional as he danced with his mother, in memory of his father who had passed earlier that year. 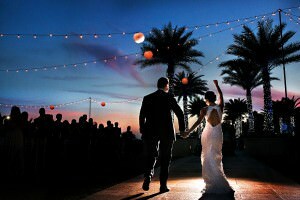 Lauren + Daniel entered their reception and immediately began their first dance as husband and wife. I saw the sun setting in the distance and with the building lit up, the cafe lights and birds flying over-head, I wanted to incorperate the whole scene. 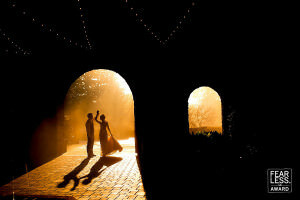 This is one of my all-time favorite first dance images! It's so much fun to photograph an exit with as much energy as this one! We love it when get to capture the action of the weddings guests last interaction with the newlyweds! Ryan and Alyssa share a moment of relief and quiet after the ceremony concluded. I always follow my couples post-ceremony as it's a great oppotrunity for celebration or quiet, sweet moments like this. I love that they are holding hands, taking in this moment together. It's so much fun to photograph a grand entrance with such a grand presence! Carly + Alex had such a beautiful venue and such strong energy as they walked into their reception! This little flower girl was almost as excited for the wedding as her aunt, the bride. 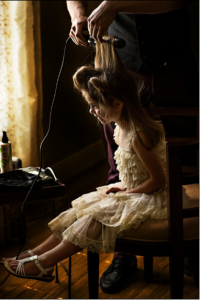 I loved how her enthusiasm showed as the stylist prepped her for her role as flower girl! The infamous sparkler exit is a Floridian tradition! The energy at the conclusion of a wedding is always such a high note to end on and document! It's the big moment when the dress is ready to be worn and you finally become a bride, except, in Donna's case, the zipper broke and simply would not budge. Her family had to work together to sew her into her dress. An otherwise unfortunate moment because a beautiful one due to the efforts of her families to get her in her dress and down the aisle! Alex and his brother are identical twins. 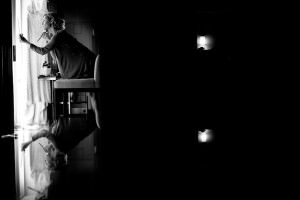 I loved the irorny of photographing the reflection of them prepping for the wedding together. 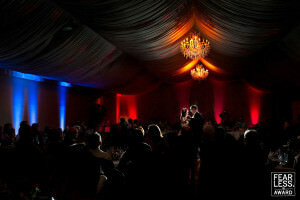 Lindsey + Mitch wanted a bright and colorful wedding reception. 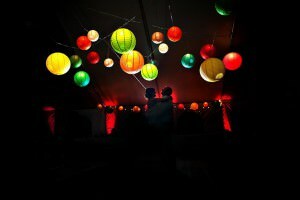 They hung colored lanterns from the ceiling of the tent and I wanted to showcase this element during their first dance! A moment from Lauren + Daniel's wedding. Lauren finishes her look prior to putting on her dress! I love looking for unique elements to create a more interest image. 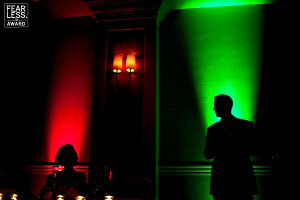 I love the energy and movement in this image from Lindsay + Matt's wedding during speeches. The way Lindsay hunches forward and Matt leans back really made this image for me! The beauty of the room for Elaine + Drew's wedding combined with the elegance of their waltz during the first dance came together in this image! 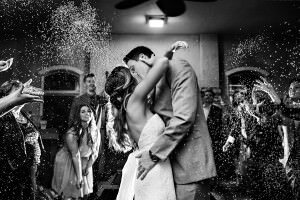 The first dance is always a really special moment for couples as they spend so few together uninterrupted at their wedding. It was a rough day for this little flower girl. So much was being asked of her, being primped and posed. When the moment came for her to walk down the aisle, I had a feeling she might finally have a melt down. I had my wide angle ready and when she lied on the ground, threw her hands on her face, and her poofy dress surrounded her, I knew we had a great moment. 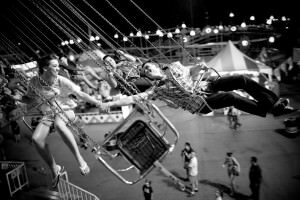 Having a strong second photographer allows us to approach similar moments from different perspectives. 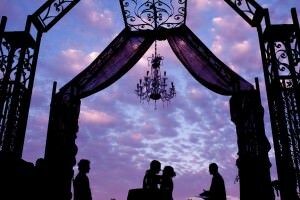 During April + Brian's wedding I snuck around behind the alter for the first kiss against the setting sun. The way Dana + Jim looked at one another during their first dance, like no one else exists, was so sweet to witness and document. The lipstick kiss on his cheek really added to the moment. 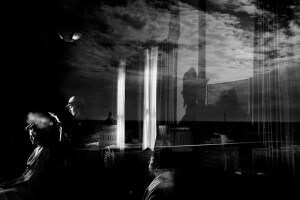 Having a strong second photographer allows us to approach similar moments from different perspectives. 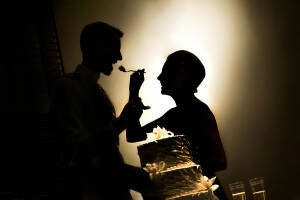 During Karmen + Joel's wedding I saw the light against the wall allowing me to create a silhouette of them feeding each other cake and decided to create a unique version of an otherwise traditional image. 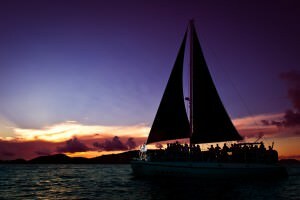 Kelly + Dan married in the Virgin Islands and treated their guests to a sail boat ride. I wanted to incorperate the whole scene and asked the captain to allow me out on the raft in the middle of the ocean in order to create this image. 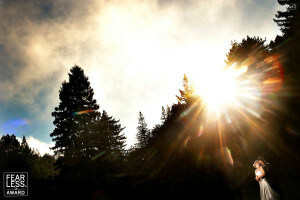 I love finding different ways to photograph the same moment! This was the moment the dress came over Janna's head. I love the look in her eye as she realizes the moment she becomes a bride is about to come to fruition. 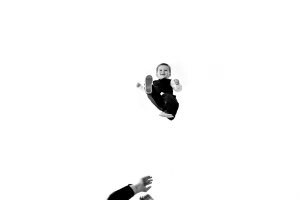 The joy on this little mans face as his father propelled him into the sky was priceless. I didn't want to show much more than the fathers hands and the boys elated expression. 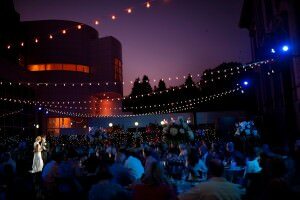 The colors of the painting at the Crocker Art Museum really complimented the wedding parties attire. It's a very simple but classy wedding party portrait and we loved creating it! A moment from Lauren + Daniel's wedding. The stylist finishes her look prior to putting on her dress! I love looking for unique elements to create a more interest image. A moment from Arti + Sean's wedding. The stylist finishes her look prior to putting on her dress! I love looking for unique elements to create a more interest image. 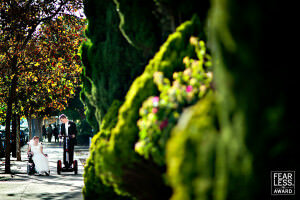 We love photographing both the women and men prepping for their wedding! I love this basic but classy image of Levi finishing his tie! 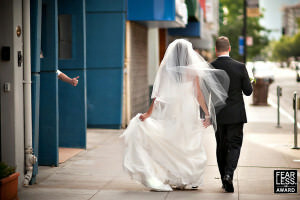 We love photographing both the women and men prepping for their wedding! An image from Melanie + Allan's wedding as the brothers fix their ties. 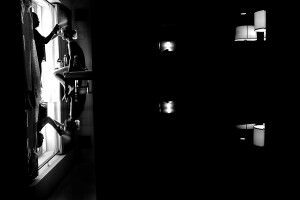 I enjoyed framing their reflection by the outline of their bodies for a more interesting perspective. An image from Ariel + Hilary's wedding that is really just a simple portrait but at the same time show cases their passion for one-another! I love the simplicty of this image as Whitney + Kyle walk to their reception and a stranger gives them a universal signs of "great job" with a thumbs up! Having nothing more than the stranges hand peaking out from the doorway adds just enough without taking away from the couple! The light against the walls of Jenica + Dan's reception as Dan toasts to his new bride really helped create a unique version of a traditional moment! 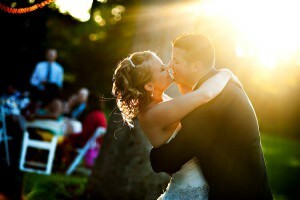 A creative portrait made at Adam + Ashley's wedding as the sun sets on their reception! 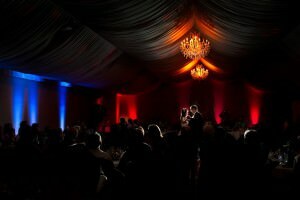 Using creative lighting really allows us to tranform an ordinary setting into anyting we can imagine it to be and we love leveraging the possibilites! Amy + Chris had a morning wedding on a very chilly day in December! The fog combined with the morning light came in and allowed for a beautiful portrait of them playing in the light. Mark + Brittany had a morning ceremony and day reception. Their day ended as the sunset and this was one of the final images we caught of the couple on their wedding day as they headed to their after party! The sun coming through Brittany's dress was magic! 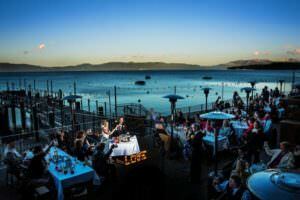 This was a very special and unique wedding for us. Melissa + Owen explained to me that the both of them have cerebral palsy, a neurological disorder that often impairs movement. They invited me to document their story and this is an of them transporting themselves to their reception. I love the excitment on their faces! It was a truly special event for us to document. A moment from Brittany + Marks weddingas the makeup artist finishes her look prior to putting on her dress! 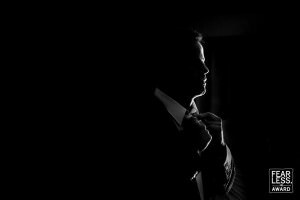 Brittany + Mark had a destination wedding in Palm Springs and I wanted to incorperate and show off their venue as much as possible. 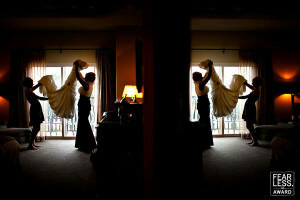 Putting on the dress is a special moment for both the bride and often times the bride's mother as well! I love how it's a moment they've both longed for, but for very different reasons. 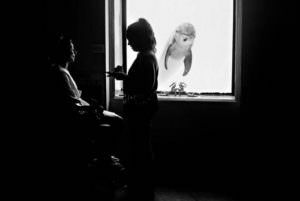 The bride to marry her best friend and the mother, to see her daughter in her wedding gown. Here Amanda's mother helps her into her dress! The energy in this image is everything to me. 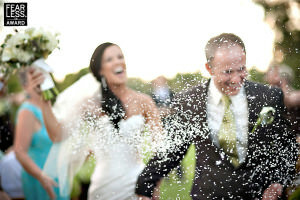 The rice is in focus and though the couple is intentionally out of focus, their expressions still come through loud and clear. 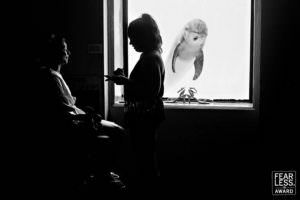 This unusual and peculiar moment was captured at the Marine Land while Sephora prepared for her wedding day. No couple ever hopes for rain on their wedding day, but this was the reward for enduring inclement weather on Julian + Jenna's wedding day! One of my favorite parts of the day is immediately following the ceremony when friends and family rush to congratulate the couple. I like to stand back and document the hugs, tears, laughter and celebration. 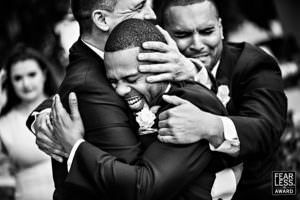 This moment was especially touching between Lloyd and his groomsmen!